Did you know that the attention span of visitors to your website is shorter than that of a goldfish? In fact, it’s only 8.25 seconds, while the lowly goldfish has an attention span of 9 seconds. That’s an incredibly short period of time in which to make enough of an impression on your visitors that they don’t click away into cyberspace. We also know that people are more likely to scroll down a page than to click through to another page. Given these realities, a single-page website can have a real advantage over more complex, multi-page sites. Strikingly, a relative newcomer on the website builder scene, is already establishing a strong following among people who recognize the benefits of single-page sites. The company is winning followers by making one-page websites available—even to those who aren’t tech savvy. So, will this Chinese company that graduated from Y Combinator, the super-fast tech incubator, prove to be a quality provider or just a cheap knockoff? 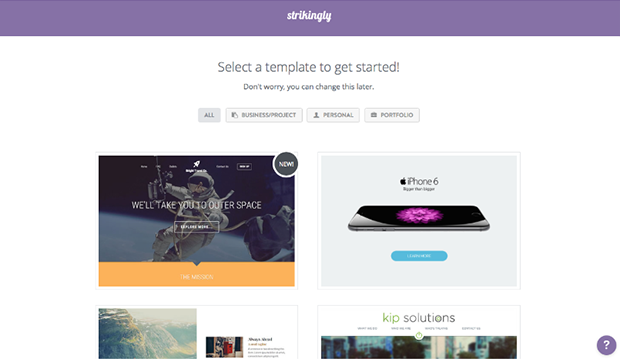 Getting started with Strikingly is easy-peasy. You simply provide your first name, email and password. Or you can log in with Facebook. Since we’re purists, we decided to take the email and password route. That accomplished, you’ll be presented with templates. After clicking on your desired template, you will be taken to the website editor. That’s all you need to do to get started with Strikingly. And best of all, it’s totally free! Well, at least, some parts of it are. You can, of course, upgrade to get more features. And keep in mind that you also can upgrade to a multiple-page website. You can stay on the Free plan forever, which includes unlimited websites with strikingly.com domain extensions. However, if you upgrade to a Limited or Pro plan, you’ll be able to connect your own domain. And if you sign up for annual billing, your own domain will be free. Not sure the upgrade is right for you? Don’t worry, you have a 14-day risk-free trial. Controls are fairly easy to understand, but there is a catch or two. Unfortunately, you can’t drag and drop objects where you want them. Elements are strictly placed where they appear in the template and you can’t do much about it. Yes, the templates are pretty, but the lack of customization and/or control of the elements can drive some potential customers away. You can add and delete elements, but only those that are regulated by the template. Although the majority of customization options are free, the mere fact that you can’t use a custom domain with the Free plan will probably nudge you toward upgrading your plan. Several features included in the Pro plan will give you greater control over the website, such as making your own sections, inserting custom codes and password protection. Not to mention that the Strikingly logo at the bottom of your page will be removed. Having said that, the features and elements set are decent. The main drawback is that we could not determine how to install third-party apps. The App Store is hidden in the adding sections area (more about that later). The majority are free, but some are available only with the upgraded plan. Several of the most popular and dependable commerce tools are built in, like PayPal and Stripe. But if you want, for example, to create simple embedded code for your Amazon wish list or eBay store, you’ll have to pay for an upgrade. In short, you’ll probably feel limited with customization because Strikingly is a stickler for maintaining their own simple and beautiful one-page designs. Although elements aren’t drag and drop (except pictures, which are uploaded online so you can easily retrieve them), the Strikingly learning curve is surprisingly short. Controls are relatively simple and in obvious places, so you won’t have much trouble in finding things. Everything you need is located on an editor panel to your left. 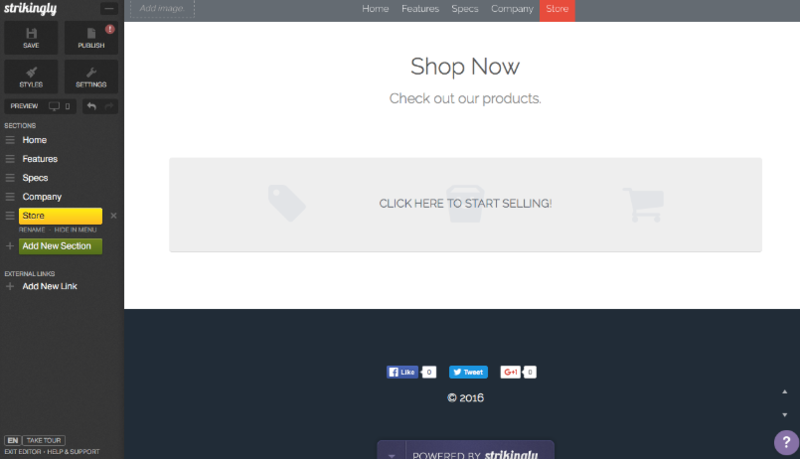 On the top of it are four big buttons: Save, Publish, Style and Settings. While the first two are self explanatory, Style will allow you to adjust the limited options for fonts, color schemes and backgrounds. You can also switch the template here and all your content will be transferred to the new template. One of the easiest template changes we’ve ever encountered—literally one click. Under Settings, you’ll find the real engine that powers your website. There you’ll be able to work with domains, descriptions, favicons, headers and footers, privacy, analytics and much more. However, keep in mind that everything is not free. For features that require payment, you’ll see a big button that says “upgrade”. This can be a bit annoying if you have a Free plan. Going back to the editor panel, below those four big buttons, you’ll have the option of switching from desktop to mobile view, and two favorite buttons for clumsy builders: undo and redo. Below that, you’ll see a list of sections that are installed on your website. Because this is a one-page website builder, sections are the main elements with which you will build your website. You can easily rearrange or delete them—or plug in new ones. 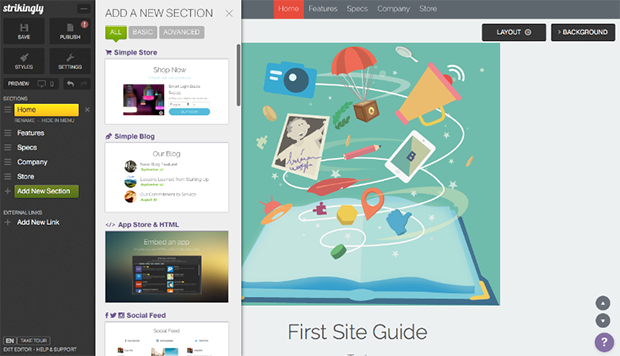 However, they are predetermined by the template, so if you want to build a custom section, you’ll have to upgrade. Other sections are restricted to specific templates. To figure out which template, you’ll have to check from template to template. Yes, there are more customization options than are obvious at first, but even then, they could be more customizable. Obviously, the Strikingly design standards are more important than the functionality of your website. Templates are responsive and since websites are one page, they are very mobile friendly by default. In short, you won’t have any problems with the design on mobile devices. Additionally, if you upgrade your plan, you’ll be able to install mobile-specific actions such as calling, texting or finding directions. All of the templates look great, but we counted only 11 of them. Sure, each template is distinct, but most people want greater variety. 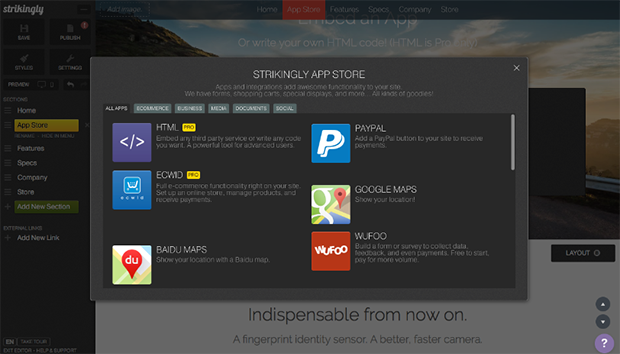 Even with the Free plan, you’ll be able to use Strikingly’s Store. Unfortunately, you will be limited to one product. We already mentioned that PayPal and Stripe are built in and Strikingly won’t take any profit from any of your transactions. However, with a Limited plan, you will be able to sell five products and with Pro plan, that will expand to 20 products. Yes, it is limited, but let’s be honest, if you want a powerful online store, a one-page website surely isn’t your first option. When it comes to meta tags, you’ll be able to edit the holy trinity: title, description and keywords. However, one-page websites aren’t the most friendly when it comes to SEO in general. One page means one set of meta tags. But when you have more pages, you have more meta tags, which means more potential traffic from search engines. On the other hand, analytics will provide you with total unique visits in the past week, today’s visits, top countries and unique views for the last day, week, month or trimester. If you want more, Google Analytics is available, but only if you upgrade to Pro plan. If you opt for annual billing, your domain will be free. However, when it comes to exporting, the short answer is: you can’t. However, the official answer by the Strikingly team is that they hope to have this function in the future. Fingers crossed. 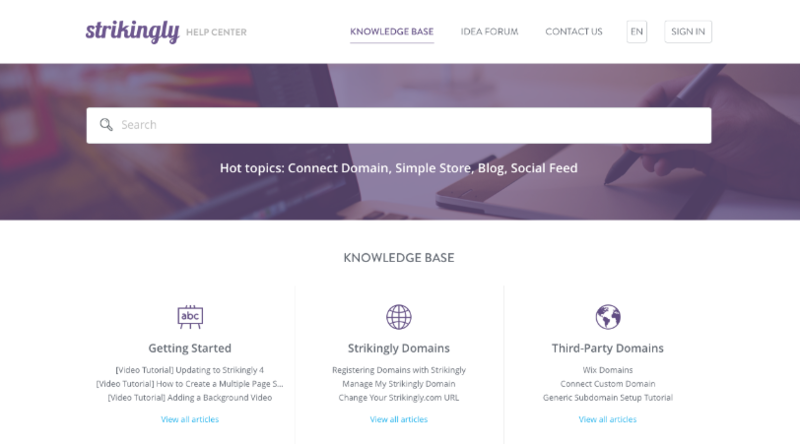 Strikingly will provide you with the knowledge base and community Idea Forum. 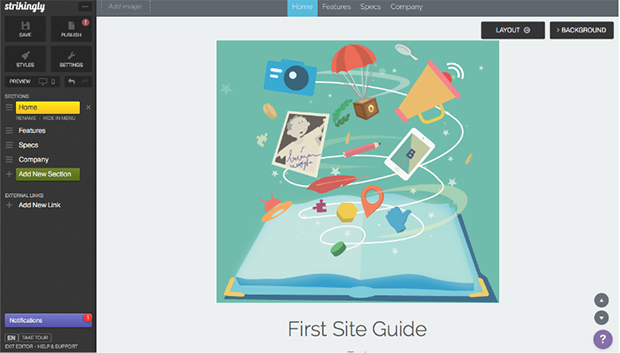 A neat little tool is hidden in the Website builder. In the lower right corner, you’ll see a question mark button where you can type in your inquiry and you will be given a short answer. While these cover a lot, the only way to contact Strikingly team is through their contact form or email, with only average response times. Occasionally, in the beginning, the team will send you an introduction/tutorial/casually written email about some option, but that’s not the same as having telephone or chat support. Hmpf, we don’t like that, but the good thing is, you’ll probably find an answer to your problem in those previously mentioned areas. There are three plans. Paid plans are billed annually. Strikingly may not be the most robust website builder out there, but when it comes to quickly building a stylish one-page website, it‘s without competition.You can get a multiple-page site by upgrading to a Pro plan, but a one-page website is where the company’s true strength lies. It’s extremely easy to use and the themes are attractive, so you’ll end up with a beautiful website. However, when it comes to templates, the options are very limited, compared to the competition. Also, simplicity may not be in everybody’s best interest. There are limitations to designing your website and advanced customization options either aren’t available or you need to pay to implement them. An odd kink is that the branding isn’t removed in all paid plans. Consider, too, that one-page websites aren’t as SEO friendly. In the end, Strikingly may seem limited to even technologically uneducated people, but its strength isn’t in robustness or even ability to sell unlimited products online. It’s great if you need to build a simple, mobile-friendly, informative (and free) website that will look slick—ASAP. But if you need a more content-heavy website, you should check out other website builders.